See the online appendix for the book. 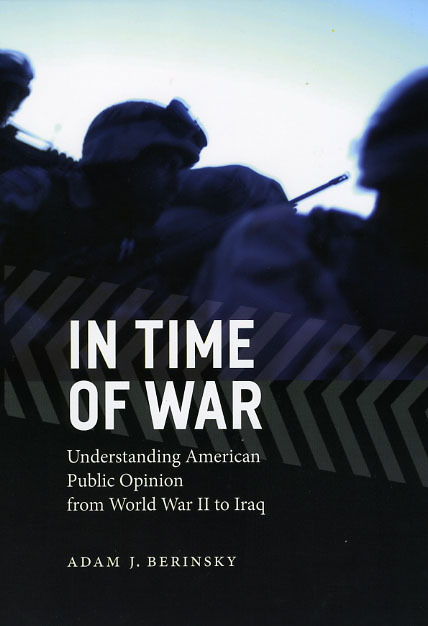 From World War II to the war in Iraq, periods of international conflict seem like unique moments in U.S. political history—but when it comes to public opinion, they are not. To make this groundbreaking revelation, In Time of War explodes conventional wisdom about American reactions to World War II, as well as the more recent conflicts in Korea, Vietnam, the Gulf, Afghanistan, and Iraq. Adam Berinsky argues that public response to these crises has been shaped less by their defining characteristics—such as what they cost in lives and resources—than by the same political interests and group affiliations that influence our ideas about domestic issues. With the help of World War II–era survey data that had gone virtually untouched for the past sixty years, Berinsky begins by disproving the myth of “the good war” that Americans all fell in line to support after the Japanese bombed Pearl Harbor. The attack, he reveals, did not significantly alter public opinion but merely punctuated interventionist sentiment that had already risen in response to the ways that political leaders at home had framed the fighting abroad. Weaving his findings into the first general theory of the factors that shape American wartime opinion, Berinsky also sheds new light on our reactions to other crises. He shows, for example, that our attitudes toward restricted civil liberties during Vietnam and after 9/11 stemmed from the same kinds of judgments we make during times of peace. With Iraq and Afghanistan now competing for attention with urgent issues within the United States, In Time of War offers a timely reminder of the full extent to which foreign and domestic politics profoundly influence—and ultimately illuminate—each other. "A major advancement in scholarship on a topic that is both timely . . . and of enduring importance. In addition to being a persuasive piece of research, it is a highly readable book that would make an ideal text for graduate and advanced undergraduate courses. Indeed, the core of the book . . . should be required reading for any course on public opinion about foreign policy." "[Berinsky] assembles some impressive and disturbing statistics that will confirm some readers’ worst doubts about how little reasoning goes into American popular feeling about their country’s wars."